IL15 (114 amino acids) is a cytokine that regulates T and natural killer cell activation and proliferation. It has a predicted molecular mass of approximately 12.5 kDa. 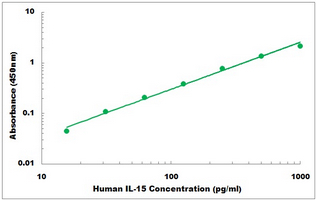 Human IL15 shares approximately 97% and 73% amino acid sequence identity with simian and mouse IL15, respectively. Both human and simian IL15 are active on mouse cells. 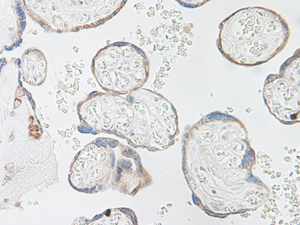 IL15 was initially isolated from the simian kidney epithelial cell line CV1/EBNA. It has also been isolated from mouse and human cell sources. The cytokines IL15 and IL2 share many biological properties and stimulatory activities (T, B, and NK cells). Both IL15 and IL2 stimulate mouse CTLL2 cells. In activated peripheral blood T lymphocytes, IL2 is highly expressed but the expression of IL15 is not detectable. There is no sequence homology between IL15 and IL2, though computer modeling indicates both possess a four alpha helical bundle structure. IL15 competes for binding sites with IL2, as both IL2 and IL15 stimulate the growth of cells through the IL2 receptor. IL15 mRNA is expressed in many cell types and tissues including adherent peripheral blood mononuclear cells, fibroblasts, and epithelial cells, monocytes, placenta, and skeletal muscle. IL-15 (14-15 kD) is a member of the four alpha-helical bundle family of cytokines. It is very similar to IL-2, except that IL-15 has an IL-15 alpha receptor subunit. IL-15 plays an important role in the growth and differentiation of T and B lymphocytes, natural killer cells, macrophages, and monocytes as well as activation of a number of important intracellular signaling molecules. This implies that IL-15 could be essential for the immune responses, allograft rejection, and the pathogenesis of autoimmune diseases. Budagian, V. et al. (2006) Cytokine Growth Factor Rev.17:259. Ma, A. et al. (2006) Annu. Rev. Immunol. 24:657. Tagaya, Y. et al. (1997) Proc. Natl. Acad. Sci. 94:14444. Duitman, E.H. et al. (2008) Mol. Cell. Biol. 28:4851. Stonier, S.W. and K.S. Schluns (2010) Immunol. Lett.127:85. Burkett, P.R. et al. (2004) J. Exp. Med. 200:825. Neely, G.G. et al. (2004) J. Immunol. 172:4225. 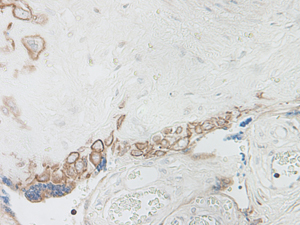 Immunohistochemistry: This antibody stained formalin-fixed, paraffin-embedded sections of human normal placenta. Western Blot analysis of IL15 expression in transfected 293T cell line (H00003600-T01) by IL15 MaxPab polyclonal antibody.Lane 1: IL15 transfected lysate(17.82 KDa).Lane 2: Non-transfected lysate. 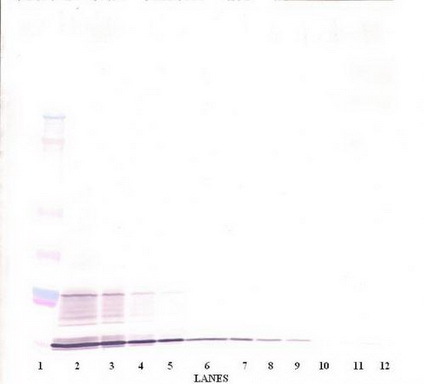 Western Blot analysis of IL15 expression in transfected 293T cell line (H00003600-T01) by IL15 MaxPab polyclonal antibody.Lane 1: IL15 transfected lysate(18.10 KDa).Lane 2: Non-transfected lysate. Western blot analysis of mouse Il15 polyclonal antibody expression in transfected cell supernatant. Immunoprecipitation of IL15 transfected lysate using anti-IL15 MaxPab rabbit polyclonal antibody and Protein A Magnetic Bead (U0007), and immunoblotted with IL15 MaxPab mouse polyclonal antibody (B01) (H00003600-B01). 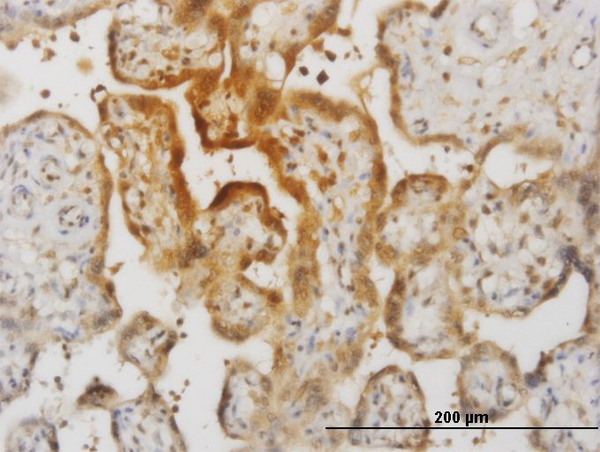 Neutralizing activity with anti-Mouse IL-15 monoclonal antibody (AM26520AF-N). After CTLL-2 cells are added AM26520AF-N and incubated for 1 hour, IL-15 (A) or IL-2 (B) are added and incubated overnight. Subsequently 1.0 µCi 3H-Methyl-Thymidine are added and incubated for 6-8 hours. After CTLL-2 cells are harvested, The radioactivity is counted with the liquid scintillation counter. The inhibition rate (%) is shown in the vertical axis and the concentration of AM26520AF-N is shown in the horizontal axis. Western blot analysis of Mouse IL-15 in transfected supernatant. 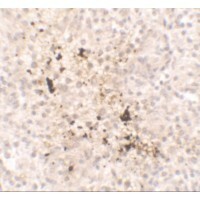 Immunohistochemistry of IL-15 in spleen tissue with IL-15 antibody at 2.5 ug/mL. To detect hIL-15 by direct ELISA (using 100 ul/well antibody solution) a concentration of 0.25-1.0 ug/ml of this antibody is required. 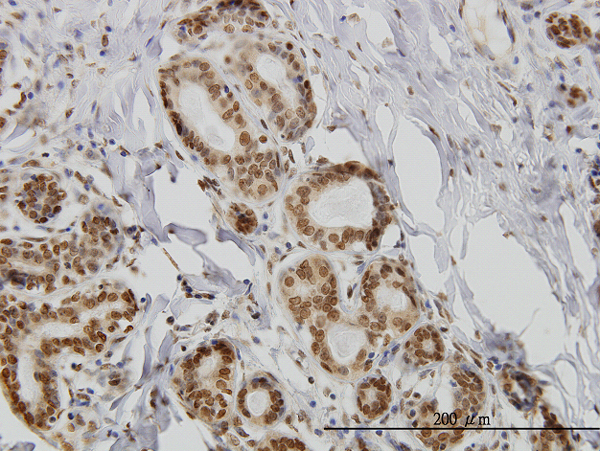 This biotinylated polyclonal antibody, in conjunction with compatible secondary reagents, allows the detection of at least 0.2-0.4 ng/well of recombinant hIL-15. 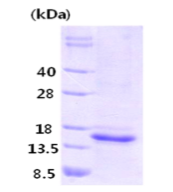 To detect hIL-15 by sandwich ELISA (using 100 ul/well antibody solution) a concentration of 0.25-1.0 ug/ml of this antibody is required. 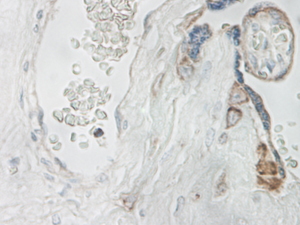 This biotinylated polyclonal antibody, in conjunction with Polyclonal Anti-Human IL-15 (TA328233) as a capture antibody, allows the detection of at least 0.2-0.4 ng/well of recombinant hIL-15. 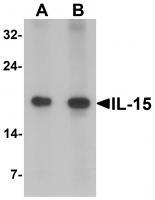 To detect hIL-15 by sandwich ELISA (using 100 ul/well antibody solution) a concentration of 0.5 - 2.0 ug/ml of this antibody is required. 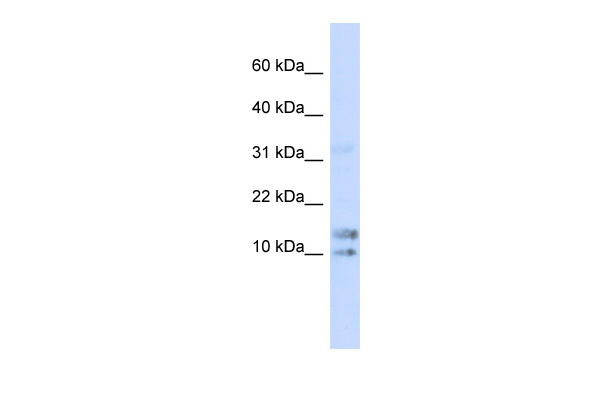 This antigen affinity purified antibody, in conjunction with Biotinylated Anti-Human IL-15 (TA328232) as a detection antibody, allows the detection of at least 0.2 - 0.4 ng/well of recombinant hIL-15. To detect mIL-15 by direct ELISA (using 100 ul/well antibody solution) a concentration of 0.25-1.0 ug/ml of this antibody is required. 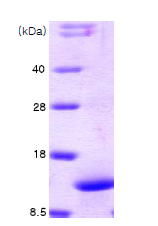 This biotinylated polyclonal antibody, in conjunction with compatible secondary reagents, allows the detection of at least 0.2-0.4 ng/well of recombinant mIL-15. 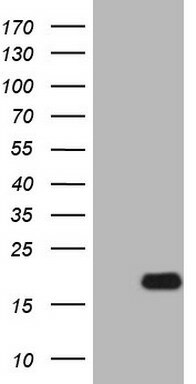 To detect mIL-15 by Western Blot analysis this antibody can be used at a concentration of 0.1 - 0.2 ug/ml. Used in conjunction with compatible secondary reagents the detection limit for recombinant mIL-15 is 1.5 - 3.0 ng/lane, under either reducing or non-reducing conditions.